Garden trendy! Inspired by the world of fashion, Garden Glory garden accessories are glamorous, chic, offbeat and ultra-stylised. They proudly stand out in the eyes of all who behold them as true decorative elements. 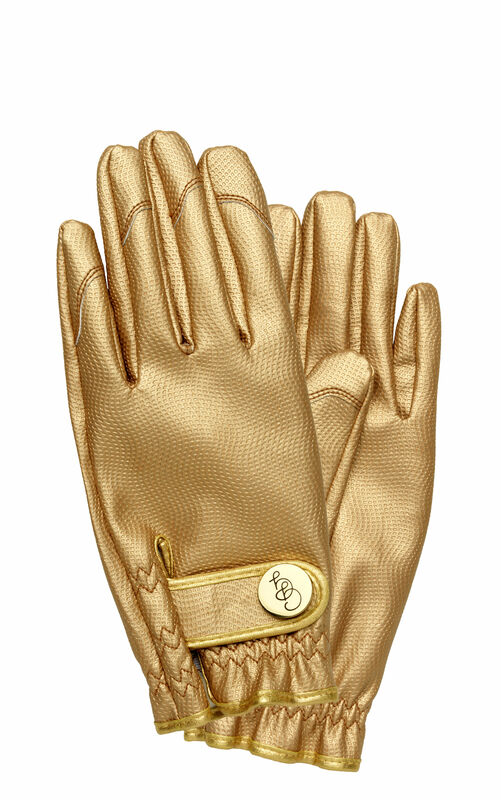 Real fashion accessories, these ultra-stylish gardening gloves are inspired by the major fashion houses and riding gloves. Real jewels in metallic colours, they feature a nice decorative brass button. These gloves are not just about their aesthetic quality! They’re also hard-wearing and functional. Made of polyurethane, they are stretchy and water-repellent. Equipped with an adjustable wristband, they fit the shape of your hands to perfection. The gloves are presented in equally refined packaging. These gloves come in 3 sizes: Small, Medium and Large.